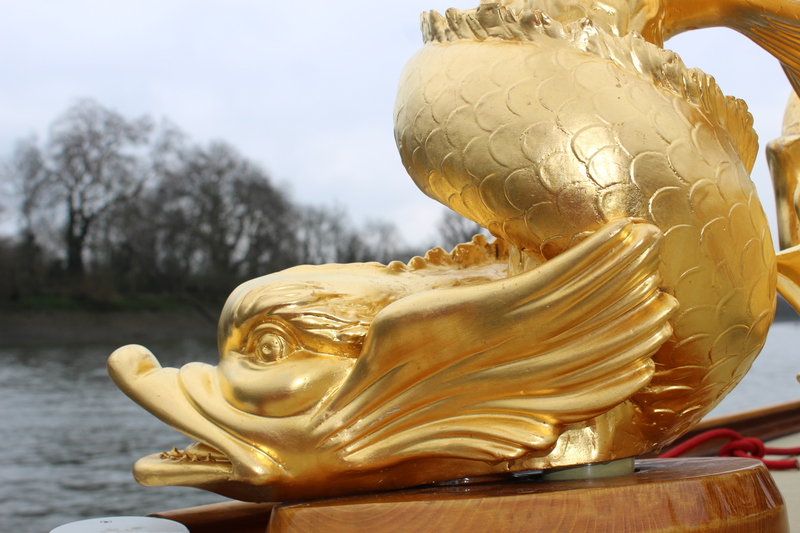 If you were able to watch the Oxford and Cambridge Boat Race or catch it on BBC Television, you might have caught sight of the Queen’s Row Barge Gloriana, her gold dolphins glaring at the dark water of the Thames. 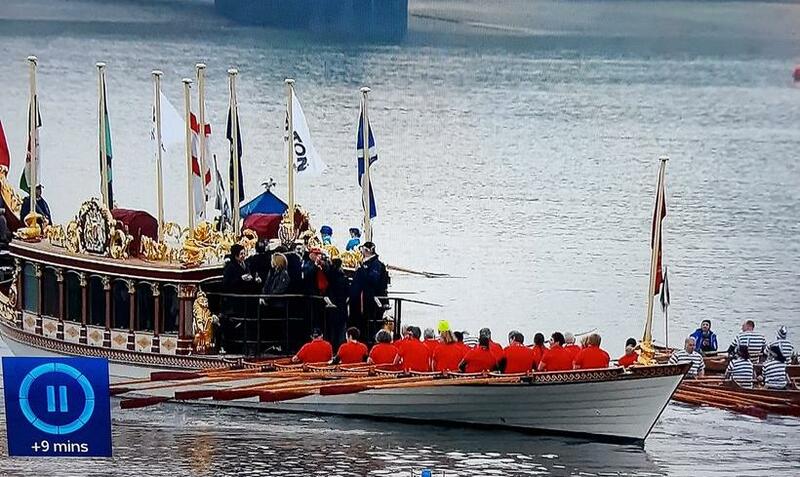 She led the Boat Race Flotilla ahead of the actual races, a warm-up act for the crowds waiting along the bank for the great event. 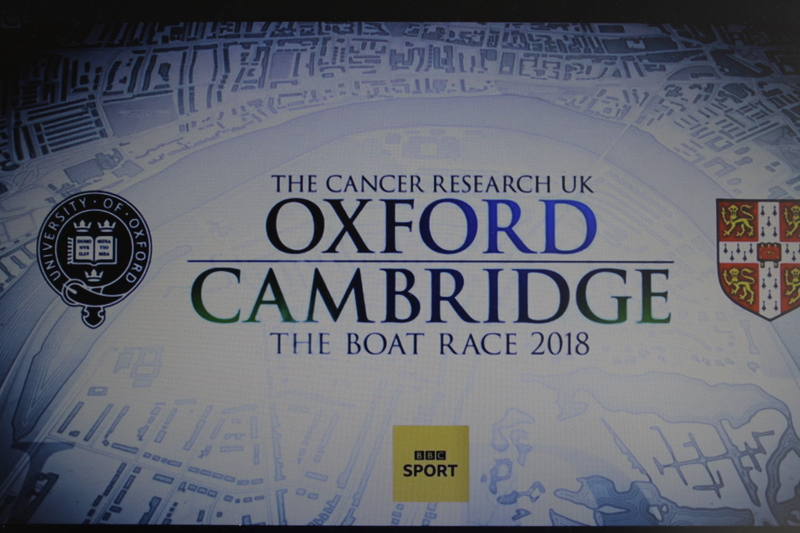 After taking a stroll past the Putney boatsheds where the television cameras were lining up under the sponsors’ banners, we rowed our passengers down the official four-mile course. 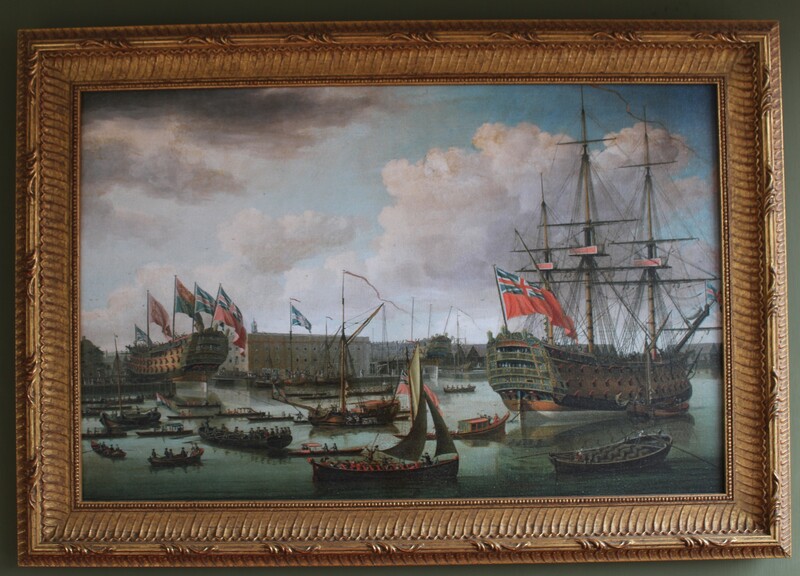 I’m on the right of this shot (above) wearing a black City Barge cap. 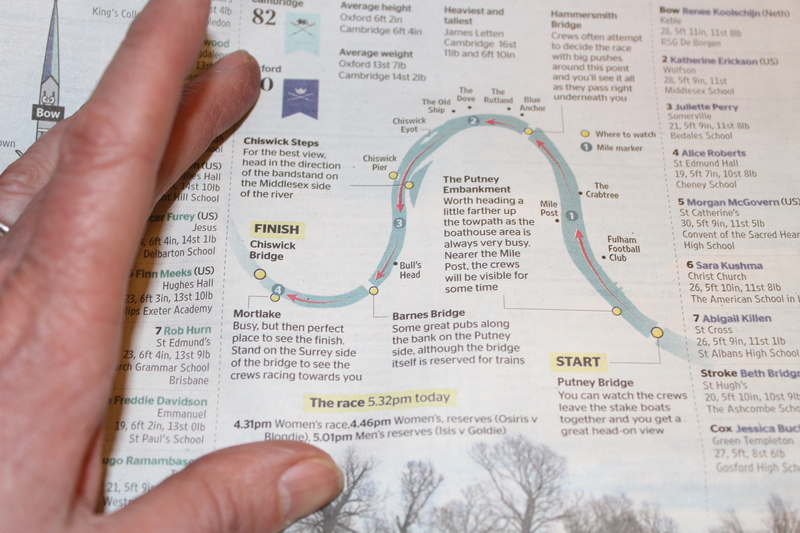 The Men’s Boat Race, from Putney to Mortlake, was established in 1845 and has also been used for The Women’s Boat Race since 2015. 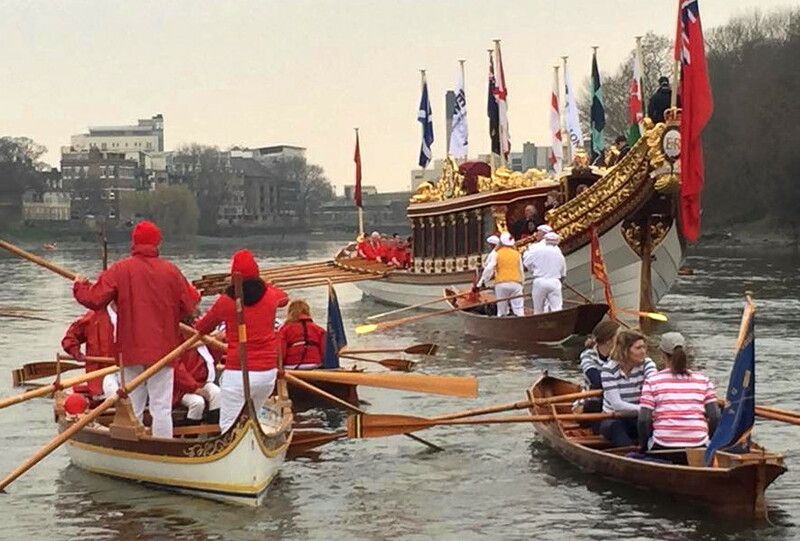 We were joined by standing-up oarsmen from City Barge, rowing Italian and Maltese vessels, while other rowing clubs joined us in Thames skiffs and a variety of other traditional craft. 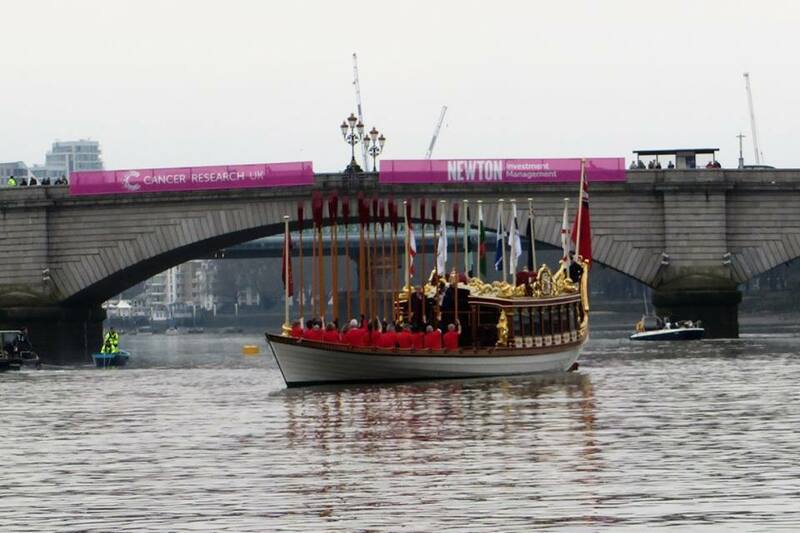 They added colour to a grey day in March and brought life to the River Thames reminding onlookers of her past glory. 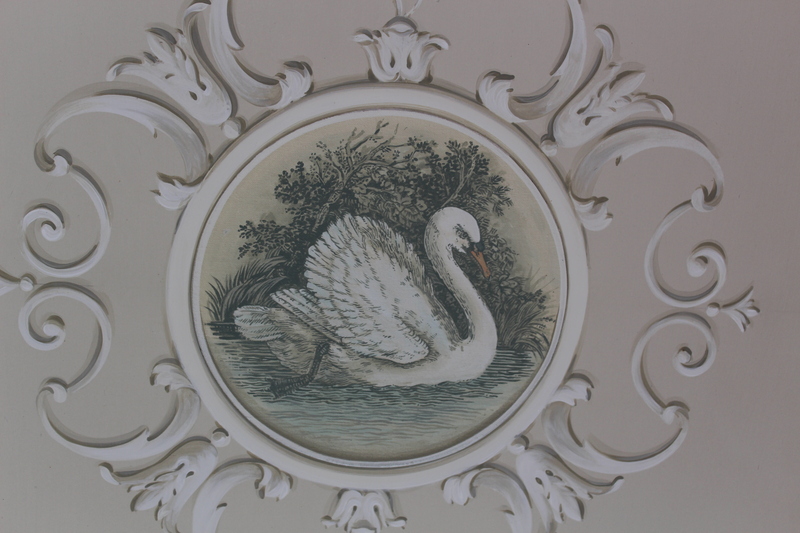 Glimpses of this was depicted on the cabin walls of the Gloriana, while hand-painted pictures of water birds adorned the ceiling. Food and drinks were laid on for our guests including excellent English sparkling wine, which has become a feature of the day. 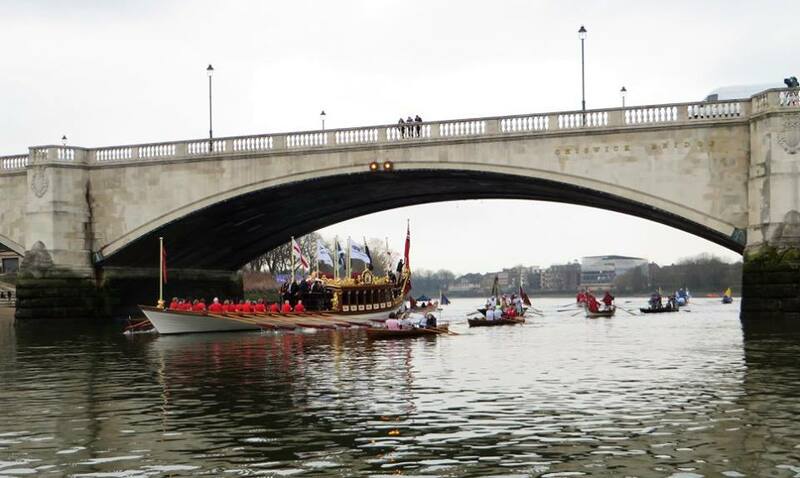 While the men’s eights to row the course in under 17 minutes, it took us 52 minutes to reach Chiswich Bridge in the Gloriana. 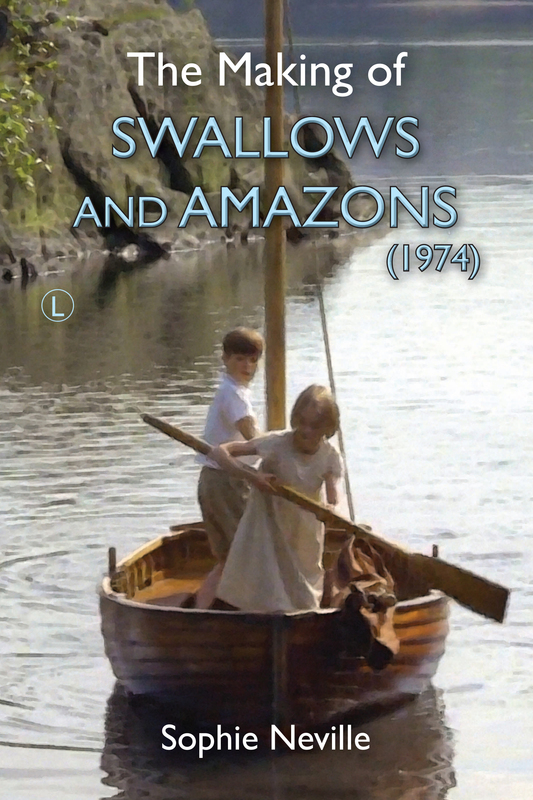 However, we were pulling 9 tons. 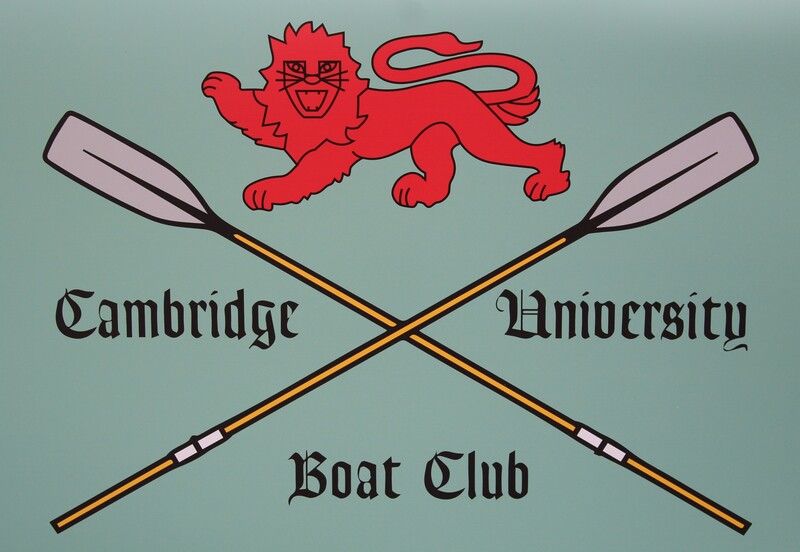 Since we were a crew of 18 oarsmen, we each pulling the equivalent of half a ton, against the stream but with the tide. We also had more than twenty passengers on board – representatives from schools nearby who hope to participate in the Future Blues scheme. 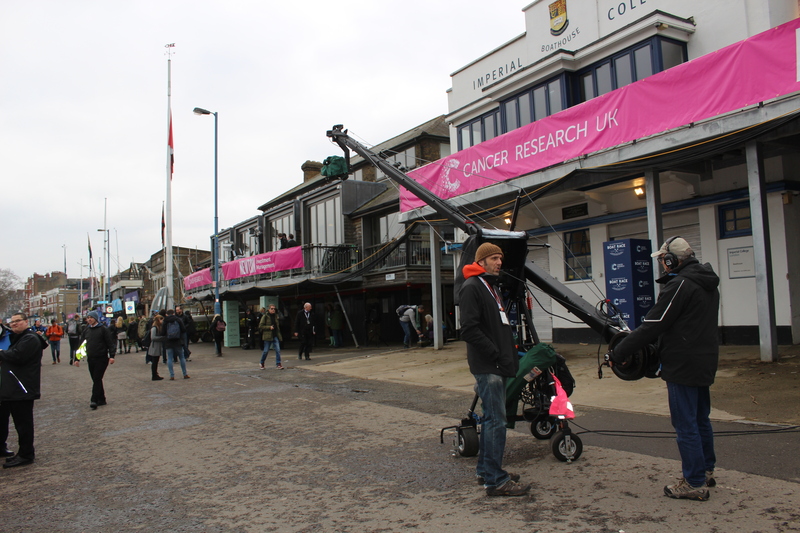 We were watched by thousands crowded along the riverside. The big thing was to keep together, which his trickier that you might imagine given the curve of the hull. 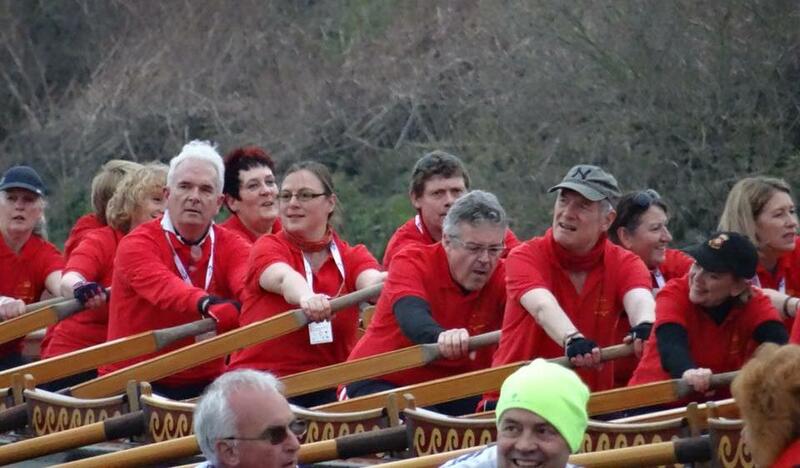 The challenge was in raising our oars to salute almost every crowded pub or boat-house along the route. 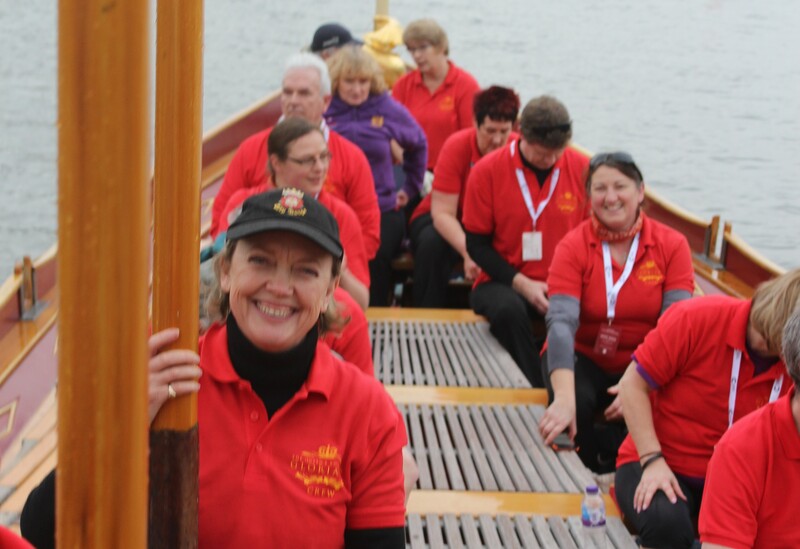 The wooden oars are 16 foot long and quite a weight. I look at myself now (thrid from the right in a black cap) and wonder how I did it. 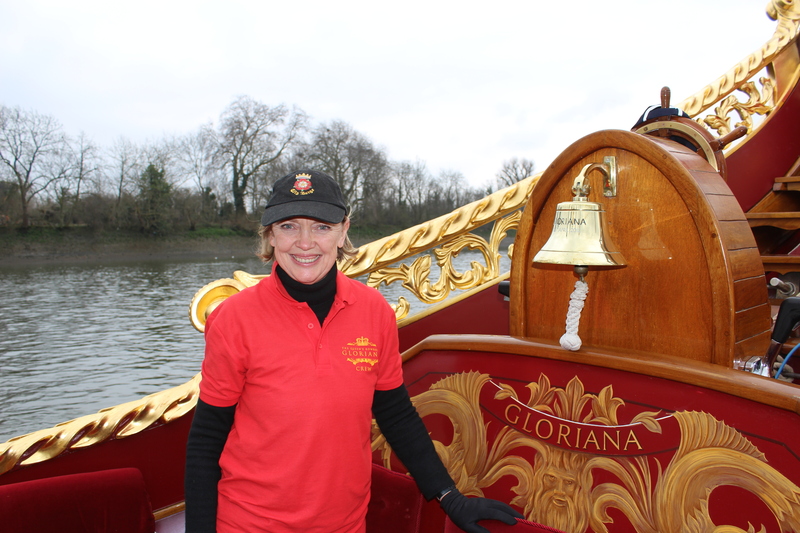 I have managed to lift my oar in Venice after rowing the Voga Longa and in Nantes after rowing 45 kilometres through Brittany but I found it tricky in the Gloriana. 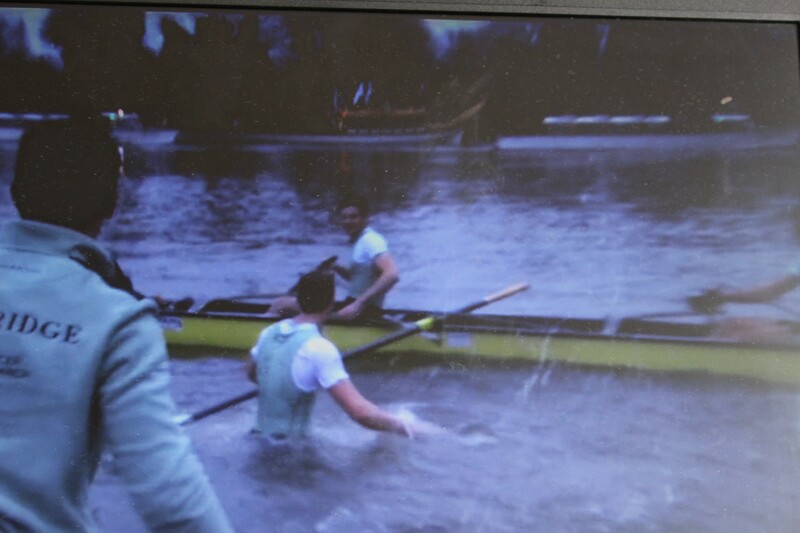 Our cox was gracious but it was clear I need more practice. I got there in the end. 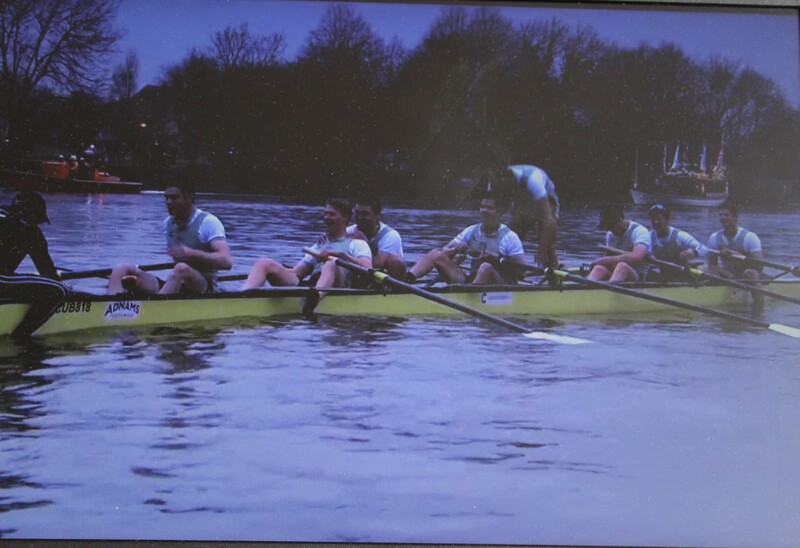 Once under Chiswick Bridge we were able to wait for the racing eights to come through after the finish. 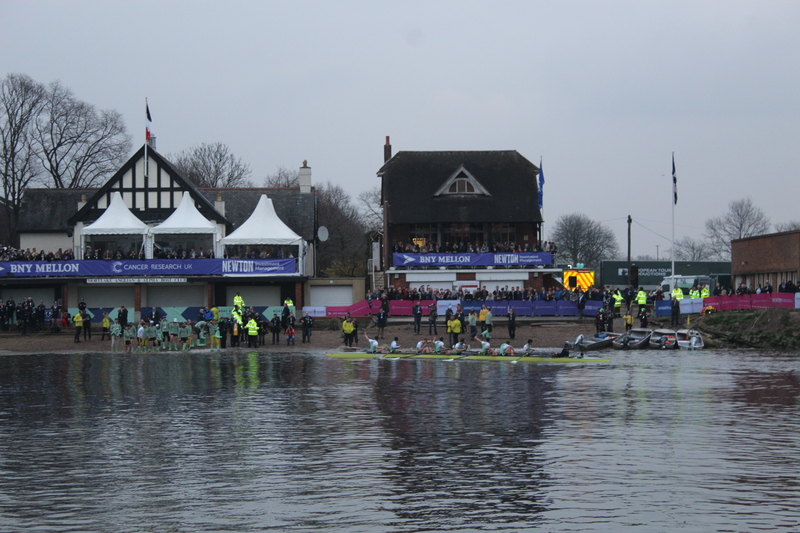 which put us in a prime position to watch the crews pull in and gather for the prize-giving. 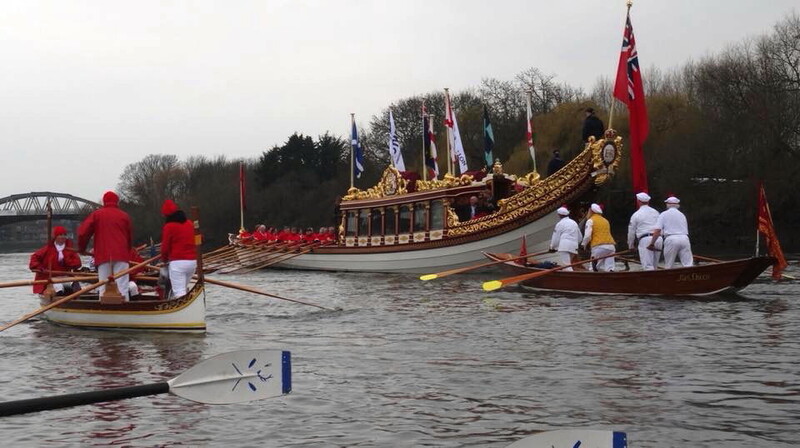 Cambridge University won both the Men’s and Women’s races with ease and enjoyed traditional celebrations despite the cold. 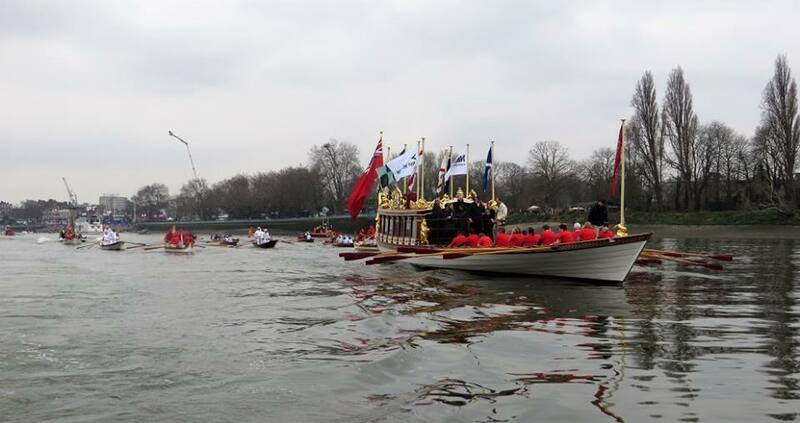 It was great to have taken part in such an exciting a national event. 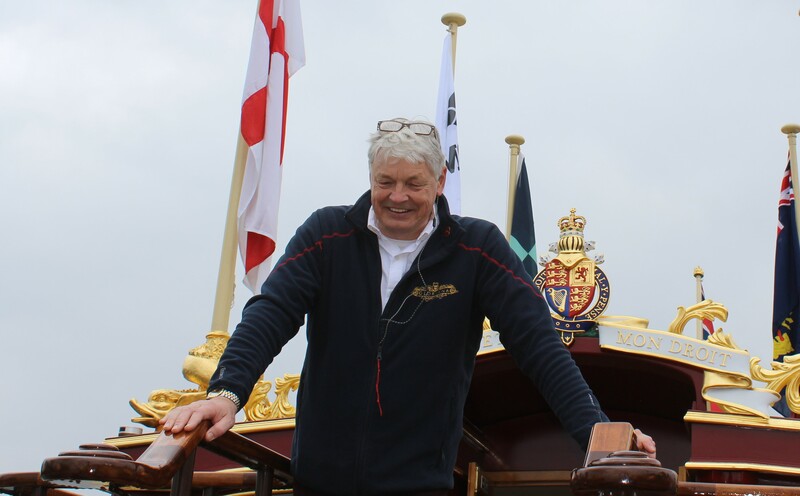 Many thanks to Malcolm Knight and The Queen’s Row Barge Gloriana for having me.